Then I noticed another listing referring to the John S. TRARES home and found it is now part of a funeral home business on Edwardsville’s Main Street. The next step was checking Ancestry.com to check the U.S. Census to locate the TRARES family. Sure enough, there was John Sebastian TRARES on 1870 U.S. Federal Census for Edwardsville, Madison County, IL, along with his wife, Josephine, and their children. What I didn’t expect to see was his nephew, Henry TRARES, living in the household and working as a druggist’s apprentice for his uncle. In those days, an aspiring pharmacist didn’t have to attend a college or a university to earn a pharmacy degree – you could apprentice with an experienced pharmacist and learn the profession from him. In fact, lawyers learned their profession the very same way. That’s the way Abraham Lincoln learned how to be a lawyer, by the way. So, as far as I know, that is the family’s first – and only that I know of – pharmacist! In addition to the births of several children: Bertha, Annie, August, Josephine and Frank – John Sebastian’s father-in-law, Martin Gerber, has joined the household. Although he is listed as a boarder, I know from checking the 1850 U.S. Census that he is, indeed, Josephine’s widowed father. How did I confirm that? I also located the cemetery records for the TRARES and GERBER families. Knowing that the Ohio TRARES clan are/were staunch Catholics, I searched for the closest Catholic church nearest to the Trares home on Main Street in Edwardsville. Then I searched for any online cemetery records from St. Mary’s in Edwardsville. But that left me with another mystery – where was John Sebastian TRARES? And why was Josephine M. TRARES, listed as “wife of J.S.,” have a birth date on her tombstone listed as 1811? This Josephine was much older than was recorded on the census. Was this really John Sebastian’s wife? And if it was Josephine’s grave, did the person making the transcription of the record make a typo? Or was this someone else? And where was John Sebastian TRARES buried? Stay tuned for Part 3 of the mystery of what happened to John Sebastian TRARES! 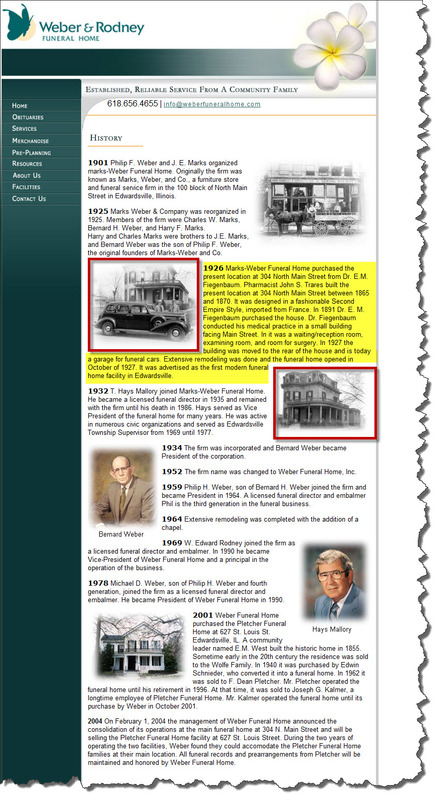 This entry was posted in Family History, Genealogy How To's, Local History and tagged Edwardsville, Gerber, Madison County IL. Bookmark the permalink. The Burton manuscript, which was written in 1938, describes Edwardsville in the 1880s and 1890s. Thanks for sharing such a wonderful memory of life in Edwardsville! The Trares drugstore must have had a special place in a lot of kids’ hearts in that town while they were growing up. I came upon your web-site when searching for information on Martin Gerber and his wife, Elizabeth Fischer. To add another family link to the Trares household of 1880, just below the highlighted portion you show is listed a servant, Martin Fischer. Martin Fischer was the nephew of Elizabeth Fischer, Josephine Gerber Trares’ mother. Martin Fischer and his sister emigrated from Aschbach, Alsace, in 1868 and probably chose to settle in Edwardsville of their aunt and her family. The length that Martin Fischer worked for his first cousin, Josephine, and her husband, John Sebastian Trares, is unknown, but he probably departed soon after his marriage later that year. Thanks for sharing your information. Thanks so much for providing Elizabeth Fischer Trares’ maiden name. I was missing that crucial piece of information. Thank you for sharing your information, too!